How Did Ebola Volunteers Know Where To Go In Liberia? Crowdsourcing! : Goats and Soda Kpetermeni Siakor was 900 miles from home when Ebola struck. But with special software, he helped direct volunteers and supplies to the right spots. 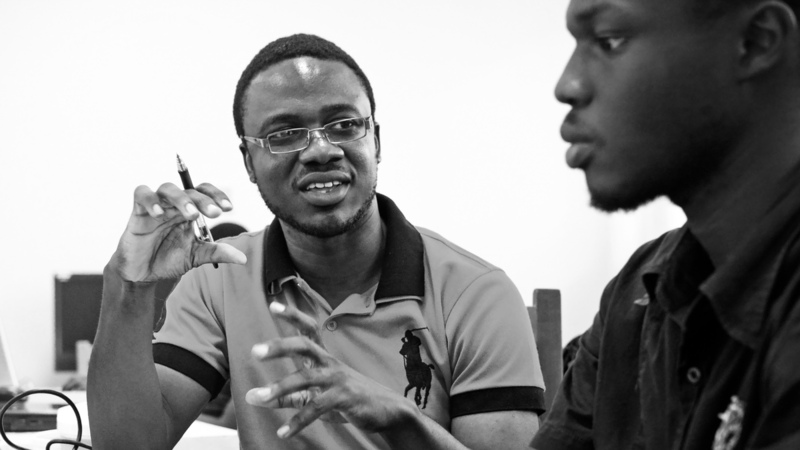 Kpetermeni Siakor (left), a Liberian who is studying in Ghana, used crowdsourcing software to help out during the Ebola epidemic. From more than 900 miles away, Kpetermeni Siakor helped get volunteers to the right neighborhoods in his native Liberia during the height of the Ebola epidemic. He did it with Ushahidi, crowdsourcing software that was developed in Kenya in 2008, when the country experienced a wave of post-election violence. The word Ushahidi means testimony in Swahili. "The government had shut down internet connections and radio stations, so Ushahidi was born out of the need to let people know what is happening," says Siakor, 26. He's a computer science student at Ashesi University College in Accra, Ghana, and receives financial support from the MasterCard Foundation Scholars Program. In its infancy, citizen journalists would map violent incidents and peace efforts on Ushahidi. Siakor worked with a team that used the software following similarly contentious elections in Liberia in 2011. Afterward, his colleagues continued to run a technology hub in Monrovia called iLab Liberia to develop technology knowledge. When Ebola broke out, they already had a perfect tool to share data and aid emergency responders in real time. Here's how it worked. Siakor and his team assigned volunteers to the emergency dispatch unit in Liberia, which would receive phone calls from the public reporting any possible Ebola cases. The volunteers would enter details into the Ushahidi system. So the Ministry of Health could see the documents in real-time, as volunteers updated the database. Before using Ushahidi, it took five days or more to get reports on the Ebola cases to the Ministry of Health. Since the team collected information about where people were contracting Ebola and where they were being treated, they could use that data to map Liberia's health centers and redistribute supplies. "There were some organizations that were dividing supplies like chlorine and gloves to various health centers," explains Siakor. Because he could track where Ebola patients were and where they were receiving treatment, he could help direct supplies and volunteers to where they were needed most. While he was managing Liberia's Ebola response from afar, Siakor worried about his family, who live just outside Monrovia. "They ended up comforting me," he says. "Whenever I called home they kept saying, 'Why are you so worried? People are fine!'" Even though there is health center nearby, no one in the community was infected with Ebola. "I'm really really grateful that none of them got infected," says Siakor. From friends and family, he hears things are different at home since Ebola broke out a year ago. "My dad tells me that if you go to town you might come back with totally bleached hands because you wash your hands [with chlorine solution] in every office you enter," says Siakor. The pace of development, which was accelerating before Ebola, seems to have come to a complete halt. It doesn't help that many businesses and schools closed during the outbreak. "Generally the very high spirits that you typically find on the streets in Liberia, you don't hear that anymore," he says. Siakor thinks that the best way to move forward is to rebuild basic health services in Liberia. And not by bringing in international groups. "People were just waiting for help to come from outside," says Siakor. "That just left the entire country vulnerable." He wants Liberia to be able to help itself. "Ebola has shown that we need to start looking at local solutions," he says.